Since the 1980s, Matthews Wall Anchor has been strengthening new and existing commercial structures in Harrisburg, PA. Many foundation companies only provide limited service for customers, however, we offer a variety of repair services such as underpinning, shoring, and piling, in addition to offering the services of a structural contractor. If you have any of these issues, look for the telltale signs of foundation failure in your structure. Some signs include foundation cracks, settlement, or bowing walls. We offer structural solutions to restore your building, bridge, garage, shed, and much more. 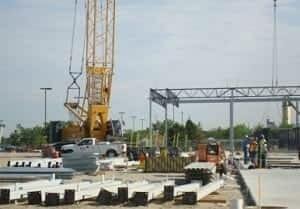 We use augercast piles and helical piles to support bridges, towers and more. Matthews Wall Anchor uses products from Earth Contact Products. For more information, contact us today so we can help answer all of your needs. We proudly serve the Harrisburg, PA area. Contact us today to learn more or to schedule a free quote and inspection.